Caribbean states devastated by recent hurricanes are selling citizenship to Middle Eastern investors to raise funds to help their recovery. But some officials warn that the islands’ rival schemes have fuelled a “race to the bottom” in which prized passports are being handed out cheaply. Islands badly hit by last month’s storms included Dominica, where 90 percent of buildings were destroyed by Hurricane Maria on 19 September, and Barbuda, which was evacuated in the aftermath of Hurricane Irma on 6 September which destroyed most of the island’s infrastructure. But, as islands begin to rebuild after the storm season, some are now enlisting the support of new friends from the Middle East. In recent years, many islands in the region have flung open their doors to Middle Eastern investors who are now fuelling a property bonanza that has been dubbed “Dubai in the Caribbean”. On top of beach-side homes and swanky hotels, some investors are also seeking what has fast become a highly prized Caribbean export – a second passport. These micro-states have populations that run into the tens of thousands but, as former British colonies and members of the Commonwealth, their passports grant visa-free access to the UK, the Schengen Area – the 26 European countries that allow passport-free travel between them – and countries as far afield as China and Singapore. But Ralph Gonsalves, the prime minister of St Vincent and the Grenadines has railed against so-called “citizenship by investment programmes” and has told Middle East Eye that “citizenship should not be a commodity for sale”. A former high-ranking US government official also told MEE that the programme could allow individuals associated with “transnational terrorist networks” to slip into the United States’ backyard. With many countries in the Middle East undergoing political turmoil, citizens of some countries have few visa-free travel options. Yemeni, Iraqi and Syrian single-passport holders are limited to travel to about 30 countries visa-free including Malaysia, Ecuador and Micronesia. Iranians and Egyptians are among other nationalities that have few options for unhindered travel. But a trip to the Dubai offices of global citizenship and residency advisory firm Henley & Partners could ease travel to many more countries – including to the major consumer markets. They are one of a growing number of citizenship brokers which, through their close links with governments around the world, allow clients to purchase citizenship in exchange for investment. 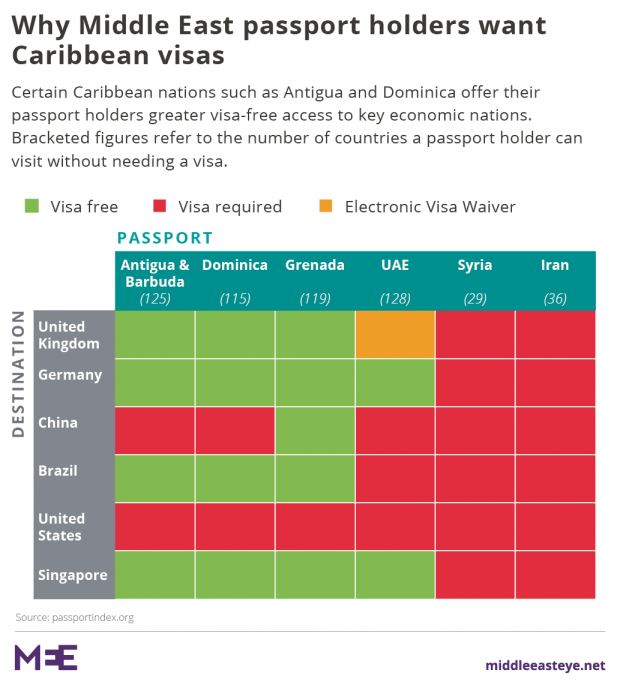 Though the firm can arrange citizenship for some European countries – such as Austria and Malta – it says that many Middle Eastern citizens prefer a Caribbean passport because it costs less, takes less time and citizenship can be passed down generations. “For those opting for a Caribbean programme, if all requirements are met, including thorough due diligence and background checks, the time to citizenship takes between four and six months,” said Marco Gantenbein, managing partner of Henley & Partners Middle East. A client who wanted to do business in Taiwan might opt for a St Lucian passport, while a Grenadan passport would grant visa-free access to China. According to the IMF, there has been a surge in clients from Russia and a steady rise in clients from the Middle East. Henley & Partners has seen a doubling in business from the Middle East since the 2011 Arab Spring, and Gantenbein says that clients from Syria, Iraq, Jordan and Egypt are moving to “globalise their family’s opportunities, secure their future and expand their business interests”. UAE investors like Dubai-based Range Development which describes itself as “an international property developer focusing on high-end hotel resorts” are leading the way in teaming up with Caribbean governments to build the very real estate that would-be citizens will be investing in. Their $200m five-star Park Hyatt on St Kitts which will open in November – complete with superyacht marina and golf course – allowed investors to pay $400,000 to take a share in the hotel and its profits, and be eligible for St Kitts and Nevis citizenship. And in hurricane-hit Dominica, clients can get a passport and a slice of Range’s Cabrits Resort Kempinski – a beach side resort tucked away deep inside a rainforest – for $220,000. Gantenbein says that the hurricanes could attract even more such investments as the islands look to rebuild. He points to the Hurricane Relief Fund set up by St Kitts and Nevis where the price of a passport for a family of four has been slashed to a one-off donation of just $150,000. But unlike Dominica and Barbuda, St Kitts and Nevis has been left relatively unscathed by the hurricanes, leading to accusations that it has tried to undercut its devastated neighbours and attract business during their hour of need. The spat highlights just how vital the scheme is to the economies of the islands. On Dominica, an island of just over 70,000 people, “passport money” accounted for around 10 percent of GDP at the end of 2013 according to the IMF, while passports were St Kitts and Nevis’s largest export accounting for 25 percent of GDP in 2013. The programme has pumped some $500m into Antigua and Barbuda’s economy since 2014 and has helped pay for social security, cancer treatment and a state of the art hospital, according to Ronald Sanders, Antigua and Barbuda’s ambassador to the United States. Sanders warns, however, that St Kitt’s price cut could “accelerate a race to the bottom that will significantly reduce revenues to other countries. The citizenship by investment programme is just one part of a series of deals which have been struck between the Caribbean and Middle Eastern nations in recent years. Meanwhile Saudi business delegations and diplomats have been taking the 11,000km journey from the Gulf to the Caribbean to meet heads of government, in trips arranged by the Trinidad Saudi Chamber of Commerce. Ambassadors have been exchanged too, including the actor Robert De Niro, who as Antigua and Barbuda’s special envoy has flown to Dubai to encourage investment. But the programme could be becoming a victim of its own success. In June, Canada cancelled visa-free travel for citizens of Antigua and Barbuda over fears that its lack of residency requirement for applicants posed a risk. Canada had made a similar move against St Kitts and Nevis back in 2015 after a number of questionable people including a Kazakh wanted for embezzlement and two Ukrainians suspected of bribing a UN official – were able to get hold of passports. Sanders adds that applicants to Antigua and Barbuda’s programme are subject to intense vetting including from Interpol and an inter-agency made up of the US, Canada and the EU. But Peter S Vincent, a counter-terrorism expert and former senior counsel for international policy at the US Department of Homeland Security, said that nations could be sacrificing security for profit. He said this could lead to restrictions on visa-free travel coming from further afield, including in the European Union where many Caribbean countries have visa-free travel. “My concerns about these programmes are based on whether the profit incentives result in less-than-robust deep diligence and vetting of applicants,” he said. The scheme has also been used as a way for Iranians to do business despite US sanctions. Capital Immigration, a Dubai-based citizenship broker run by Iranian expatriates, advertises a Dominica and St Kitts and Nevis passport on its website in both English and Farsi. Though there are ways to do this legally, St Kitts and Nevis has already earned the ire of the United States after three Iranians were sanctioned by the US Treasury Department for using their St Kitts passport to launder money on behalf of banks in Iran. 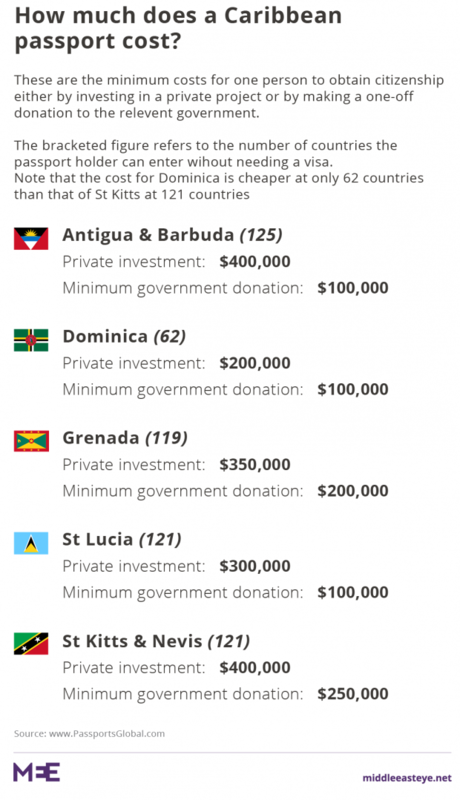 But not all Caribbean micro-states are so keen on citizenship by investment. Despite being one of the poorest countries in the region, St Vincent and the Grenadines – famed for its pristine coral reefs and for royal favourite Mustique – has opted out of the programme. “Our position is simple: The highest office in the land is that of citizen. It is what constitutes the bond between persons within a political society and it is not for sale,” said Ralph Gonsalves, prime minister of St Vincent and the Grenadines. Gonsalves claimed that in some Caribbean countries, 10 to 15 percent of the population are economic citizens, a situation that is likely to get worse. According to IMF figures, in 2013 alone St Kitts approved over 1,000 new applicants against a population of just over 54,000. Gonsalves, who opened formal diplomatic ties with the UAE in 2009 and who has received funding from Dubai for education this year, said that his country also enjoys good relations with Qatar, Kuwait and Palestine but that he preferred to look for investment “in the most sustainable ways”. “We are building relations in the Arab world. It takes a little patience to build confidence and trust there,” he said.